A specialty of Italy's far northern Südtirol/Alto Adige region, which has considerable German and Austrian influence, speck is a type of cured ham that's basically a lightly smoked version of the more-familiar prosciutto. It's an element of the typical South Tyrolean marende: a wooden board layered with very thin slices of speck, local sausages and cheeses, and small pickles, and served with hearty country bread and wine or beer. Speck is also an essential ingredient in canederli—traditional South Tyrolean round dumplings made with bread. Despite advances in the food industry, the production of speck remains quite traditional and speck has been granted IGP (Protected Geographical Indication) status, which means that it can only be made in the Südtirol region and only following time-honored production techniques. No shortcuts, such as speeding up curing time by injecting brine, are allowed. Instead the producers (about 27 scattered throughout the region) procure their hams from freshly slaughtered locally raised pigs at the end of the fall, and salt-cure them with coarse sea salt and a mixture of herbs—the mixture varies from producer to producer, and the producers keep their formulas secret, passing them on only to the heirs who will continue the family business, but generally the mixture contains black pepper, red pepper, garlic, juniper berries, and a little sugar. After two to three weeks of curing, the hams are lightly smoked for another two to three weeks, using cool smoke (at temperatures not above 20 C/68 F) from non-resinous woods. Finally, the speck hams are hung to air-dry in a cool place for four to five months. When the speck is ready; the producer cleans it and sends it to market; by comparison with prosciutto, the lean meat part of speck is a darker, richer red, tending towards a dark ruby color, while the fat is white to pale pink. Ideally, there should be about 50% fat and 50% lean meat in a speck (this is the ideal for prosciutto too), but one often sees specks that are almost entirely lean meat, and this may be a response to market pressure because most people don't want much fat. In terms of texture and flavor, speck is a bit firmer than Parma or San Daniele prosciutto and has pleasing smoky notes that mingle with the sweet-savory pork flavor of prosciutto. 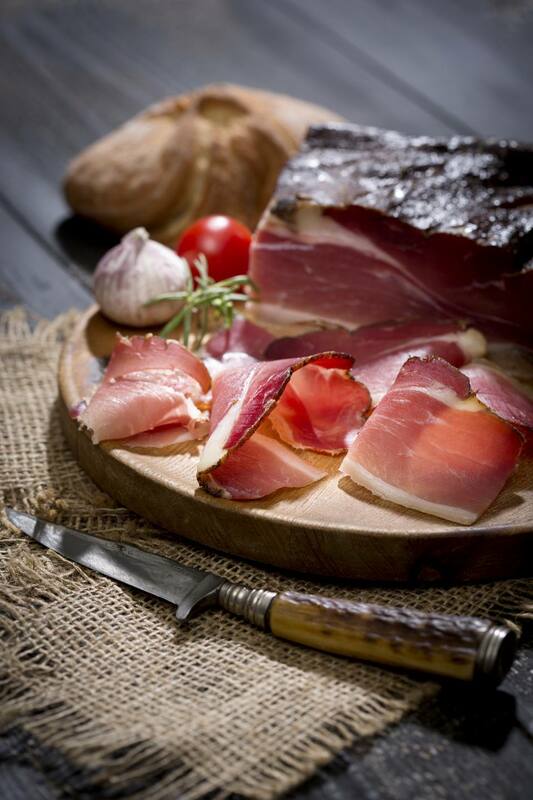 In the Südtirol, speck was traditionally used to welcome visitors, together with some wine and hearty bread. If you cannot find speck for a recipe that calls for it, you can substitute it with either pancetta (ideally the flat, rather than rolled, variety), or slab bacon, preferably hickory-cured bacon containing the smallest amount of sugar possible.